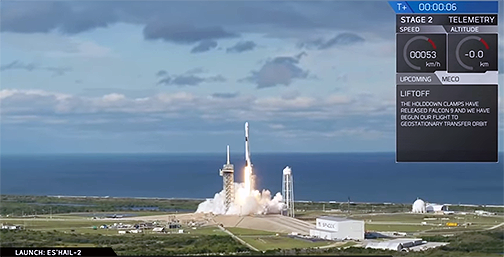 SpaceX successfully launched the Es’hail-2 satellite for Dubai-based Es'hailSat on Thursday, November 15, from Launch Complex 39A (LC-39A) at NASA’s Kennedy Space Center in Florida. Kennedy Space Center in Florida. Image capture from the SpaceX infocast. 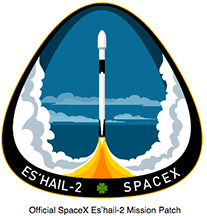 Es’hail-2 separated from the second stage of the Falcon 9 rocket at 00:18 Doha time on November 16 and the solar panels were fully deployed approximately two hours after liftoff. The spacecraft is currently in its transfer orbit, and Es’hailSat expects to bring the satellite into commercial service at 26 degrees East orbital position by January 2019, upon completion of In Orbit Tests (IOT). Built by Mitsubishi Electric Company (MELCO), based on their DS 2000 satellite bus, Es’hail-2 has a proven, modular platform with high power capability and flexibility for a broad range of applications. In addition to offering Ku-band capacity to support the growing 25.5 degrees East / 26.0 degrees East broadcast neighborhood, Es’hail-2 also features multi-transponder Ka-band capacity with sophisticated anti-jamming capabilities to provide business and government sectors with secure communications across the MENA region. The spacecraft has a design life in excess of 16 years. In partnership with leading service providers, Es’hailSat will offer a portfolio of broadcast and VSAT services to support business growth. The spacecraft’s multi-mission architecture will enable Es’hailSat to respond to demand for the fastest-growing applications in the Middle East and North Africa, including content transfer, broadcast distribution, enterprise communications , and government services. 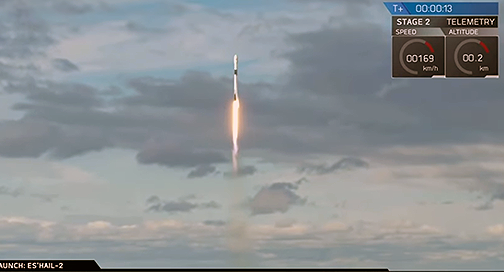 The Falcon 9’s first stage for this Es’hail-2 mission previously supported the Telstar 19 VANTAGE mission in July of 2018. Following stage separation, SpaceX landed Falcon 9’s first stage on the “Of Course I Still Love You” droneship, stationed in the Atlantic Ocean. Ali Al Kuwari, the President and CEO of Es’hailSat, said that he wants to dedicate the successful launch of the company's second satellite to the Emir of Qatar, H.H. Sheikh Tamim bin Hamad Al-Thani, as well as the Government and people of Qatar. These are exciting times for Es’hailSat and Qatar. Es’hail-2 is the first fully operated satellite for Qatar and is a symbol of Qatar’s commitment to free, secure and independent communication.